The Boston Globe was founded in 1872 by six Boston businessmen and by the 1890s Wikipedia tells me it was a stronghold with an editorial staff dominated by Irish Catholics. Wikipedia also tells me Tom Winship succeeded his father as editor in 1964 and transformed The Boston Globe from a local paper into regional paper of national distinction. When he stepped down as editor in 1984 it had won not just its first Pulitzer Prize during his twenty year reign but a dozen. 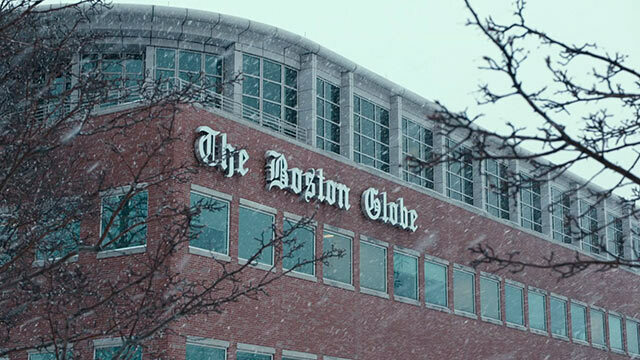 From 1993 until 2013 The Boston Globe was owned by The New York Times. In the 1990s it launched an online website which has regularly been ranked as one of the ten best newspaper websites in the country. The quality of their digital work can be seen for example here in this piece. It is a prestigious publication with a storied history, something Boston can be proud of. 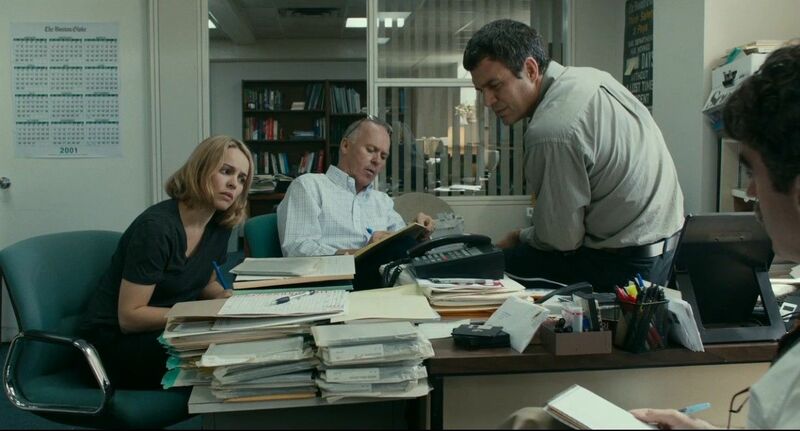 There are several shots in Spotlight with The Boston Globe marquee; a little romanticism is shown not just for The Globe but for print journalism in general. The Spotlight team is led by their editor Walter “Robby” Robinson portrayed by Michael Keaton who carries tremendous gravitas as an elder statesmen in this film that it is hard to believe this guy was Beetlejuice. I’ve spent my lifetime watching this man and even in something like Duplicity or Batman he brought such energy to his performance. Not here, here he is quiet and he carries the movie – Mark Ruffalo is not the star. Speaking of Mark, he’s terrific as Michael Rezendes the type of role you might have handed to a young Michael Keaton both professionally determined and yet often radiating a certain swagger. 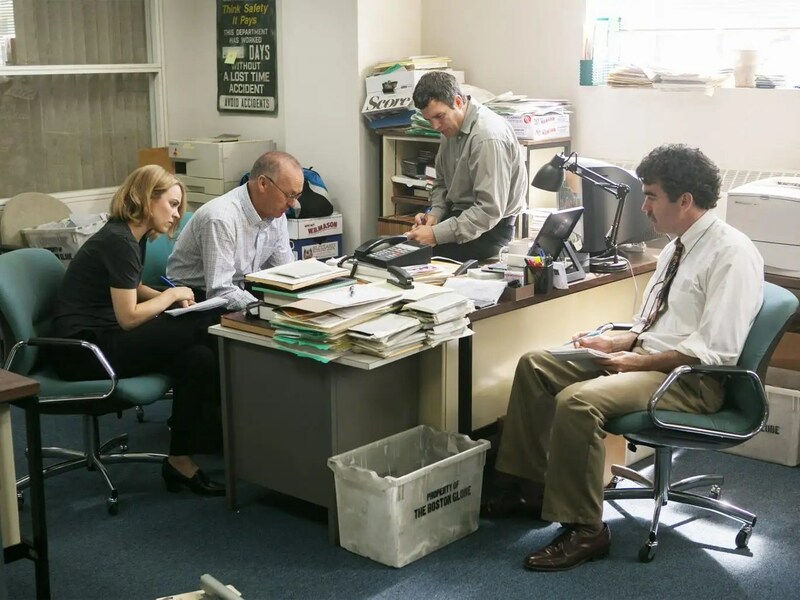 Brian d’Arcy James, predominantly a stage actor, plays Ben Bradlee Jr. who uncovers some interesting facts in old archives before realising uneasily that former perpetrators might be living close to his house. Rachel McAdams one of the most talented young actresses working today plays Sacha Pfeiffer who is the journalist who gets the brunt of the interviews with actual victims. A personal viewpoint of the abuse is never really shown. We meet the victims as adults hurting but determined to tell their story and we see them from the perspective of the journalists who are moved by their stories but have to be professional and have to discern what is true. The reporters confide in each other as the story begins to make them confront their own beliefs, heritage and feelings. Many years ago a very wise man came to my house with a DVD to watch called The Station Agent. It was reflective of his taste and of many experiences where my best friend introduced me to great films I had never heard of. Director Tom McCarthy has been a filmmaker I have followed ever since. In that film he dealt with broken people discovering they could love again and have a place in the world. One character was getting over the death of a child and McCarthy was spellbinding in the way that he would cause greater effect by underplaying everything and showing wise restraint. That wonderful gift is on display here in a film that deals with something very painful. Demographics have changed in Boston as they have throughout the rest of America but for the purposes of popular culture there is something distinctly Irish Catholic about Boston, MA. You can imagine then the trauma at the heart of an old respected local broadsheet staffed predominantly by Irish Catholics unearthing the first real proof of the Catholic Church’s cover up of abusive priests. It is arguably two great big Boston institutions at war with each other and there are several small meeting room scenes where old Boston guys sit down and talk about what to do with the kind of polished charm that makes one uneasy. Michael Keaton is riveting in these moments. Sidenote: Many years ago Keaton starred in another journalism ensemble The Paper, one of those good dramedies Ron Howard did so well back in the day, which was about the daily beat of a regular journalist but also carried this film’s romantic idealism for the good, good journalism could do. Film Critic Roger Ebert who always considered himself a journalist first and foremost loved that movie. I think he would’ve loved this one too and Roger I miss you, I miss your thoughts and your wonderful words about movies even when I disagreed with you. Films like this make a splash at awards season but often can struggle to find a wide audience. They get labelled ‘Important’, ‘Well Made’ with a ‘Terrific Ensemble Cast’ but people may hesitate to know if the film will involve them or worse be too confronting. Yes Spotlight is well made and about something important boasting an All Star Ensemble. However it is so much more, it’s terribly moving as the victims tell their stories and also as various forces seek to turn around our heroes. The crowd I saw it with on a Tuesday night was visibly moved . At the end we got up without a sound and left the cinema quietly and solemnly. Like we were leaving Church.